The Alfa Romeo BAT 7 came out of the house of Bertone - Italian coach-building firm, par excellence. It was the work of the young Franco Scaglione - a rising star of the Bertone team. It was one of a series of cars he designed - which also included the BAT 5 and BAT 9. BAT stood for 'Berlinetta Aerodinamica Technica'. Airflow was key. Scaglione's goal was to decrease cornering drag - at the same time as increasing frontal downforce. A by-product of that - and another core objective - would be to extract 125mph from the 100bhp engine. Scaglioni met all these criteria - with flying colours. The BAT 7's drag coefficient was 0.19 - a figure a modern-day supercar would struggle to match. And that, from a car built in 1954! Okay, the BAT 7 was never going to be a roadster. That said, its sibling - the BAT 9 - did put some real miles on the clock. The BAT 7 only strengthened the bond between Alfa and Bertone. The latter had designed the bodywork for the Giulietta Sprint GT - now an established product in the Alfa range. The insights gleaned by Bertone from the three 'BAT' cars had been vital. From its rakish low nose - to the folds of its 'tail-fins' - air did not stand a chance! In time, Bertone's lessons in shape-shifting would be learned by other cars. Few, though, would have the magic of the Alfa Romeo BAT 7. 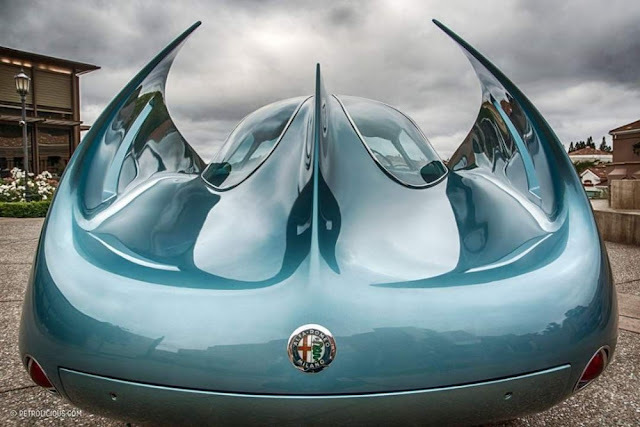 An automotive manta ray, Alfa had taken metalwork to another level!